Sign up at Millionaire Casino on our site to be able use the promos and coupon codes listed below. Cashout Time: eWallets up to 24 hours, Credit/Debit cards 6 days, Bank Transfers up to 10 days, Cheques up to 28 days. Embrace a world of fun at Millionaire Casino. This iGaming destination that offers top casino entertainment for both desktop and mobile platforms, offers a diverse selection of incredible games from world leading software developers like NetEnt, Microgaming, WMS, Barcrest Games and IGT among others. Powered by Progress Play Limited Casino, Millionaire online casino was established in 2012 and holds licenses from the Malta Gaming Authority and the UK Gambling Commission. When you play at this safe, secure and fair gambling destination you will discover that there is a decent range of promotions that include a large Welcome Package, weekly promotions and a VIP program. There is a huge collection of slots that you can spin for your chance to win, as well as a live casino, Jackpot games, casual games and table games. No matter what you might be in the mood for, you’ll discover in this Millionaire Casino review that this site delivers in one way or another. At Millionaire Casino, you’ll discover that games are split up into six different categories. These include: Slots, Jackpots, Mobile Games, Featured, Casual Games, and Table Games. It’s always nice to see a site that is well organized as this makes navigation and knowing what the casino offers far easier and more convenient. Millionaire Casino games are powered by several different software providers including some of the industry’s big names like Microgaming, NetEnt, WMS, NextGen Gaming, Lightning Box, Barcrest and Aristocrat. 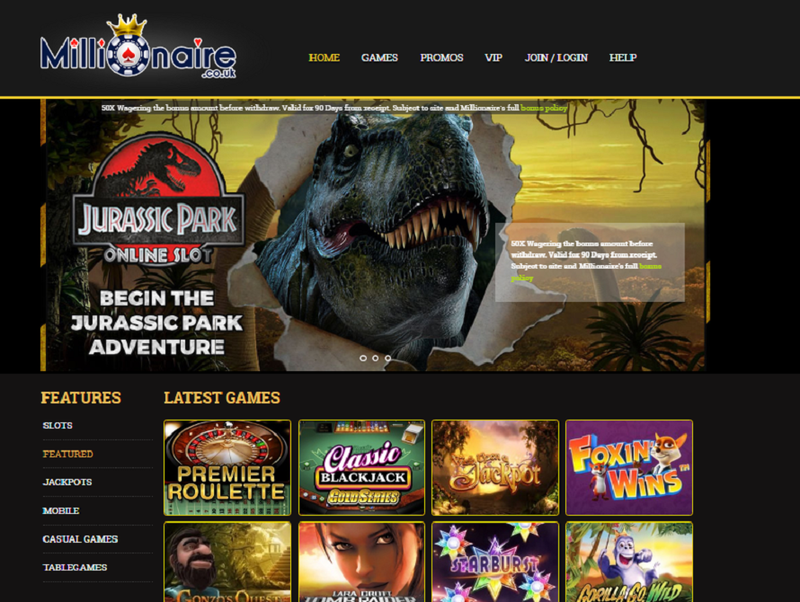 This means you’ll find cool video slots like Jurassic Park, Game of Thrones, Starburst, Gonzo’s Quest, King Cashalot, Treasure Nile and many, many more. What about the Millionaire Casino mobile offering? You’ll find loads of games to keep you entertained and gratified on your Android smartphone or tablet, or iPad or iPhone. There’s a huge range of slots as well as table and card games and even the live casino! For non-mobile players, the full suite of games can be accessed without download via Instant Play (Flash). Finally, those who enjoy table games will find a decent selection of favourites like Roulette, Blackjack, Poker and Baccarat. You also have your pick of casual games, such as Keno, Bingo, and arcade-style games like Germinator, Diamond Deal and Mega Money Rush. Millionaire Casino online promotions help players to feel like they are on their way to big fortune right from the start. Take the amazing Welcome Package that awards you with a free 100% welcome match bonus up to a maximum £600 on your first deposit! Plus, on your second and third deposits you have the chance of claiming up to £400 more in bonuses! Although this is a very generous bonus, there is a slight drawback in that the wagering requirements are a rather high 50x. Also, the bonuses are valid for 7 days and if they are not used within this time period they will expire and cannot be reclaimed. Be sure to read all bonus terms and conditions. If you’re looking for more than one Millionaire Casino bonus you’ll also find Weekly Surprise, Game of the Day, Cashback Day, Monday Madness, Big Cash Weekend Race and Spin the Slots Weekend. As you can see there are plenty of promotions to enjoy all week long. If you like VIP rewards, you can collect VIP points by wagering on your favourite games. The VIP scheme has multiple levels and gives you the chance to enjoy more exclusive perks the higher you climb. In addition, you also have the option of redeeming the points that you collect for cash. Make fast and safe deposits with a variety of eWallet and credit card options. There is also a prepaid card option and debit cards. Choose from Millionaire Casino payment methods like Visa, Skrill, Neteller, Paysafecard, Maestro, MasterCard, and Paybyphone among others. As for withdrawals, you can use most of the same methods, plus Bank Wire Transfer and Cheque, with the exception of Pay by Phone. Withdrawals typically take anywhere from 1 – 7 business days and up to 28 days in the case of cheques. Accepted currencies include Euros, British Pounds Sterling, US dollars, and Swedish Kronor. 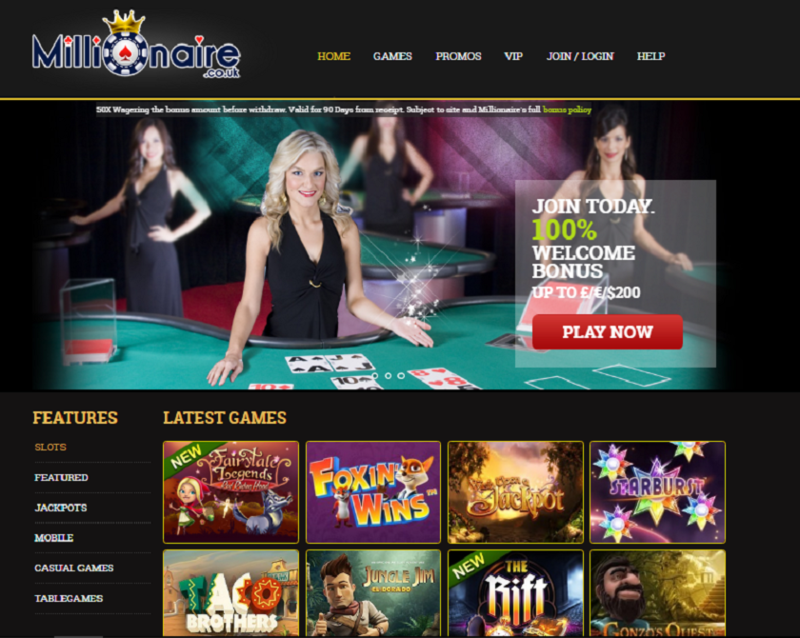 Unlike many other online casinos offering live chat support, Millionaire Casino’s is 24/7. They also offer email 24/7. Millionaire Casino customer support is friendly and professional and an FAQ is available if you’re seeking quick answers to your common questions. Millionaire Casino has supported play on mobile platform, you just hold your smartphone at the image area to get the direct link to Millionaire Casino on your mobile. Millionaire Casino has restricted from United States, but you can choose another casinos to play from your country.